Note to editors: A photo for this release will be available on the Canadian Press picture wire via Marketwired. A Stand Up To Cancer Canada Dream Team researching new approaches to treating triple-negative breast cancer (TNBC) and other aggressive types of breast cancer has been formed thanks to a $9 million investment from a coalition of funders. 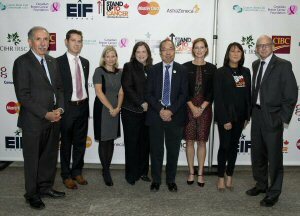 The Dream Team reflects a collaboration of Stand Up To Cancer Canada (SU2C Canada), the Canadian Breast Cancer Foundation (CBCF), with support from CIBC and the Ontario Institute for Cancer Research (OICR). The American Association for Cancer Research (AACR) International - Canada, is SU2C Canada's scientific partner. Tak W. Mak, PhD, director of the Campbell Family Institute for Breast Cancer Research at Princess Margaret Cancer Centre in Toronto, is leader of the Dream Team. The Dream Team co-leader is Samuel Aparicio, BM, BCh, PhD, Nan and Lorraine Robertson chair in breast cancer research at the University of British Columbia in Vancouver and head of the Department of Breast and Molecular Oncology at the BC Cancer Agency. The SU2C Canada-CBCF Breast Cancer Dream Team is the first to be announced since SU2C Canada was launched in 2014. The team is funded over a period of four years for $6 million provided by SU2C and by CBCF, with support from CIBC, and $3 million from OICR. The team will conduct clinical trials in six provinces, with those in Ontario funded by the OICR commitment. SU2C Canada funds derive from its nationwide telecast last year that appealed to the Canadian public to pledge support for cancer research, awareness, and education. The Dream Team's research project seeks to develop new therapies for aggressive breast cancers. These novel treatments will be aimed at changes in the genomes of cancer cells that make the tumours unstable and vulnerable to attack. That is, these new drugs will exploit the cancer's "Achilles' heel." The Dream Team will test three candidate drugs for their effectiveness in halting or slowing the processes by which cancer cells reproduce. The researchers also hope to identify biomarkers of drug activity that will help match patients with the most effective treatments for their particular form of breast cancer. "Attacking the genetic instability of the tumour cells in aggressive breast cancers hasn't really been tried before," Mak said. "We will give our new drugs to patients for whom other treatments have not worked, and monitor them to see whether a significant percentage of these patients responds to one or more of these drugs. By respond, we mean that we hope these patients' tumours shrink, or at least that their disease holds steady rather than getting worse." "If our clinical trials are successful, our program has the potential to eventually deliver new drugs that will act against several very aggressive breast cancer subtypes, which currently lack effective targeted therapies," Aparicio said. "By exploiting our increased understanding of cancer evolution and genomics to the single-cell level, we hope to co-develop biomarkers and treatment combination strategies that will identify the patient groups most likely to benefit from the new drugs we are testing." In addition to the leaders, the principal investigators on the Dream Team include Morag Park, PhD, director, Rosalind and Morris Goodman Cancer Research Centre, McGill University, Montreal; Kathleen Pritchard, MD, senior scientist at Sunnybrook Research Institute, University of Toronto; and Karen Gelmon, MD, professor of medicine at the University of British Columbia in Vancouver. Serving as advocates for patients, their loved ones, and those at risk are Randy Mellon of Toronto, breast cancer survivor and patient advocate; Zuri Scrivens of Langley, British Columbia, breast cancer survivor and patient advocate; and Wendie den Brok, MD, advanced TNBC survivor and medical oncologist in training at the BC Cancer Agency in Vancouver. Den Brok will also serve as an investigator on the scientific team. "We lack effective treatments for TNBC and other types of aggressive breast cancer," said Phillip A. Sharp, PhD, Nobel laureate and institute professor at the Massachusetts Institute of Technology's David H. Koch Institute for Integrative Cancer Research, who serves as co-chair of the SU2C Canada Scientific Advisory Committee (CSAC). "The SU2C Canada-CBCF Breast Cancer Dream Team plans to change this by developing new drugs that will target the vulnerabilities of this disease." Serving with Sharp as co-chair of the CSAC is Alan Bernstein, PhD, president and chief executive officer of the Canadian Institute for Advanced Research (CIFAR). "The new Dream Team is made up of some of Canada's top cancer researchers, building on many years of outstanding research conducted in Canada," Bernstein said. "Importantly, the clinical trials will be carried out across the country. This is Canadian science at its best." Dramatic advances in breast cancer therapy in recent years have led to fewer women dying from the disease, noted Lynne Hudson, CEO of CBCF. "But one in nine women in her lifetime can expect to be diagnosed with breast cancer, and we need to do better," Hudson said. "Developing new therapies that get to patients faster, particularly for subtypes that don't have the same kind of treatment options as the more common types of breast cancer, is a priority for us and our community. This partnership with SU2C Canada - and most significantly this Dream Team - is really about boldly pushing into those new areas and developing desperately needed treatments." "With so many Canadian families affected by breast cancer, CIBC is proud to continue our longtime partnership with the Canadian Breast Cancer Foundation by supporting this outstanding Dream Team," said Christina Kramer, CIBC executive vice president, and its Executive Run Sponsor for the CIBC Run for the Cure. "By investing in innovative collaborations like this, we will change the future of breast cancer here in Canada and around the world." OICR's funding will be critical in setting up early clinical trials to test the new drugs, once their safety and effectiveness has been shown in the laboratory according to Thomas J. Hudson, MD, president and scientific director of OICR. "OICR and SU2C Canada share a common purpose in supporting translational research," said Hudson. "That is, ensuring the best scientific discoveries in cancer research are successfully developed into new approaches and therapeutics that will benefit patients. We are happy to join forces with SU2C Canada and CBCF to support this team." "Ontario is pleased to support innovative research through the Ontario Institute for Cancer Research," said Reza Moridi, Ontario Minister of Research and Innovation. "This Dream Team is a perfect example of the type of collaboration that our province is looking to foster and promote. Finding new and innovative ways to treat breast cancer brings hope to patients and their families and has the potential to create major health and economic benefits." The SU2C Canada-CBCF Breast Cancer Dream Team is one of the two inaugural Dream Teams evaluated by the CSAC. SU2C Canada, a project of EIF Canada, a Canadian registered charity, also plans to announce the second Dream Team, which is focused on cancer stem cells. The Mak-Aparicio team was selected after careful consideration by the CSAC led by Sharp and Bernstein. The review process began with a Call for Ideas issued by AACR International - Canada in October 2014. Three finalist teams met with the CSAC and the Breast Cancer Subcommittee in Toronto in June 2015 to present their plans and respond to questions, an unusual level of face-to-face interaction between applicants and reviewers that helps to ensure that the best applicant is selected. In addition to Sharp and Bernstein, the CSAC consists of Carlos L. Arteaga, MD, professor of medicine and cancer biology at Vanderbilt University School of Medicine in Nashville, Tennessee; Carol L. Prives, PhD, DaCosta professor of biological sciences at Columbia University in New York; Jenny C. Chang, MD, Emily Herrmann chair in cancer research and director of the Cancer Center at Houston Methodist Hospital in Houston; and Sheila Toews, former chair of the Manitoba Provincial Health Ethics Network, as patient advocate. Also involved in the review was the CSAC Breast Cancer Subcommittee, chaired by Nancy E. Davidson, MD, director of the University of Pittsburgh Cancer Institute; Shannon L. Puhalla, MD, assistant professor, University of Pittsburgh School of Medicine; Laura J. van 't Veer, PhD, professor at the University of California San Francisco Helen Diller Family Comprehensive Cancer Center; and Eric P. Winer, MD, chief of women's cancers at the Dana-Farber Cancer Institute in Boston. As the scientific partner to SU2C Canada, the AACR International - Canada, the Canadian arm of the world's largest scientific organization devoted to cancer research, is responsible for administering the contract and providing oversight to ensure that progress is being made. EIF Canada, a Canadian registered charity (Reg. # 80550 6730 RR0001), founded by the U.S.-based Entertainment Industry Foundation, was established to conduct charitable programs in Canada addressing health and other issues. 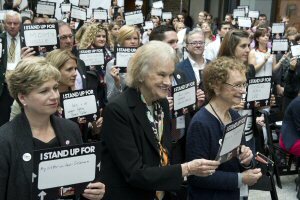 Stand Up To Cancer Canada (SU2C Canada) is a program of EIF Canada that raises funds to support collaborative research teams, as well as education and awareness programs conducted in Canada. Organizations collaborating with the SU2C Canada initiative include the Canadian Breast Cancer Foundation, with support from CIBC; the Canadian Cancer Society; the Cancer Stem Cell Consortium, with funding from Genome Canada and the Canadian Institutes of Health Research; the Ontario Institute for Cancer Research; and The Hospital for Sick Children (SickKids). 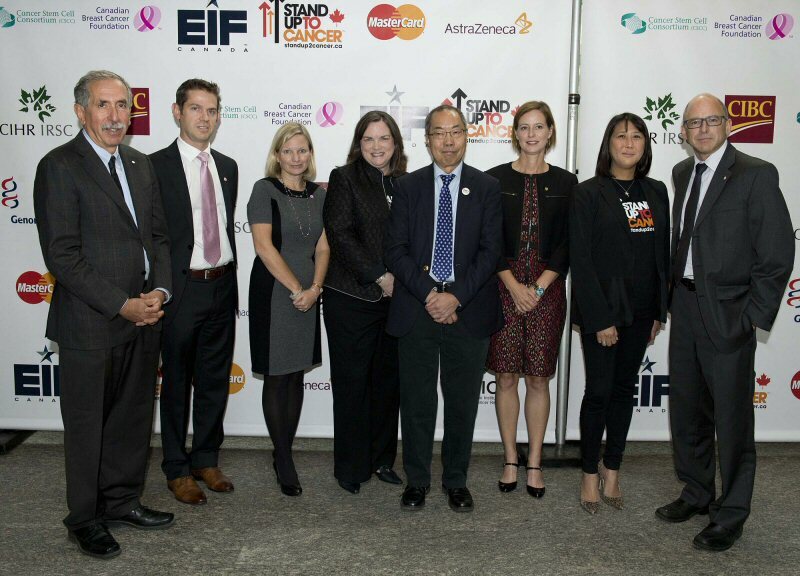 MasterCard and AstraZeneca are the first Canadian corporate supporters of SU2C Canada. Canadian Breast Cancer Foundation (CBCF) is the leading community-driven organization in Canada dedicated to creating a future without breast cancer. Its investments in innovative and relevant research and education have led to progress in breast cancer prevention, diagnosis, treatment and care. Since 1986, CBCF has been at the forefront of a nationwide movement supporting and advocating for the breast cancer community. For more information, visit http://www.cbcf.org. The mission of AACR International - Canada is to prevent and cure cancer through research, education, communication, and collaboration. AACR International - Canada convenes topical scientific conferences; offers educational workshops, fellowships, and research grants; collaborates with cancer survivors; raises public awareness of the progress in cancer research; and advocates for strong research funding. As the Scientific Partner to Stand Up to Cancer Canada, AACR International - Canada provides scientific oversight and conducts expert peer review and grants administration. For more information, please visit www.AACRCanada.ca.